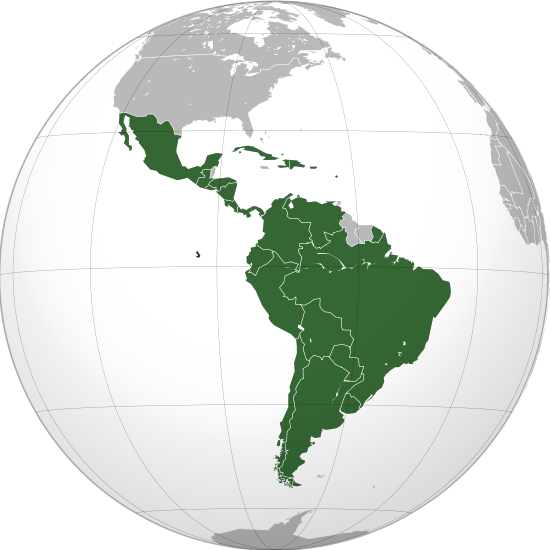 Limited data suggest that multiple sclerosis (MS) in Latin America (LA) could be less severe than in the rest of the world. The objective was to compare the course of MS between LA and other regions. Centers from 18 countries with >20 cases enrolled in the MSBase Registry participated. Patients with MS with a disease duration of >1 year and <30 years at time of EDSS measurement were evaluated. The MS Severity Score (MSSS) was used as a measure of disease progression. Comparisons among regions (North America, Europe, Australia and LA), hemispheres and countries were performed. A total of 9610 patients were included. Patients were from: Europe, 6290 (65.6%); North America, 1609 (16.7%); Australia, 1119 (11.6%); and LA, 592 (6.1%). The mean MSSS in patients from LA was 4.47 ± 2.8, 4.53 ± 2.8 in North America, 4.51 ± 2.8 in Europe and 4.49 ± 2.7 in Australia. Mean MSSS in the northern hemisphere was 4.51 ± 1.6 compared to 4.48 ± 1.9 in the southern hemisphere. No differences were found for MSSS among hemispheres (p = 0.68), regions (p = 0.96) or countries (p = 0.50). Our analyses did not discover any difference in mean MSSS among patients from different regions, hemispheres or countries.